Today I am happy (interpret that ecstatic if you want) to bring you my interview with Linda Urban. She is the author of A Crooked Kind Of Perfect, a novel that was so so so good, that I had to read it TWICE within the same week. 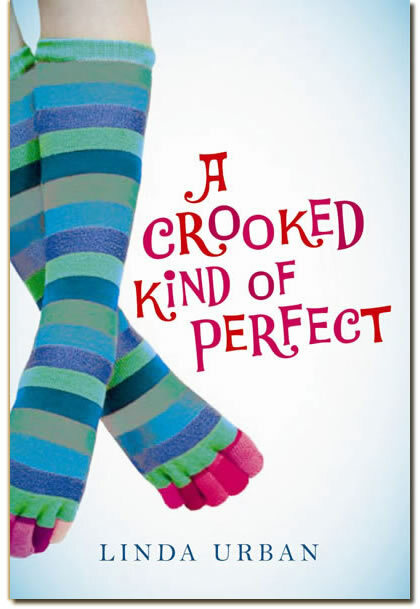 You can read my review of A Crooked Kind of Perfect here. It has been nominated for a Cybils. And it appeared on the Amazon's Best of 2007 list. Be sure to visit her official site and her livejournal site. I was having a conversation with the author/illustrator David Small about music and told him about how my dad bought an organ instead of a piano. I told him how my dad was seduced by the fancy rhythm switches. David said how he could just see that illustration. A few weeks later, as I was driving to work, the first line of a picture book popped into my head and I had to rush into my office and write it down. You’ll notice I said picture book above. The first incarnation of this story was as a picture book. It wasn’t until about a year later that I started it as a novel. Once it started, it came fast – a couple of months, tops, for the first draft. I love all the people in the book. Except maybe Joella Tinstella. And I wish I had a Wheeler in my fifth grade life. I think the last scene is my favorite, but I also like Emma’s Really Big Shoe – that excruciating birthday party. Poor Zoe. Will we by any chance see another book featuring Zoe and Wheeler? (I could even see one told from Wheeler's point of view.) I’d love to see how (or should I say if) this like like relationship develops! People have asked for a Wheeler book and for an Emma book. Right now I have plans for neither, but I won’t say never. Do you, like Zoe, dislike the excessive use of exclamation points? Was that scene with the manual or brochure drawn from real life by any chance? Yes!!! I think they spring from a culture in which we are always being encouraged to Get Excited!! – usually about some new product. I’ve read tons of brochures like the one in the book, haven’t you? You know “Welcome to the exciting world of your new GDS (Garbage Disposal Supreme) – the first kitchen waste system with Sansismear!” Yeesh. It is a garbage disposal. I’ll be excited if it works. For now, just calmly tell me how to install it without losing a limb. Zoe’s song choice of “Forever In Blue Jeans” seems so perfect. She, of course, didn’t know the words to the song. Didn’t understand the message. Was that song choice an easy one for you? Did you choose it because of the lyrics—the message—or was it because it is one of your favorites? I used to think it was “Reverend Blue Jeans” when I was a kid. The song just sort of appeared there on the page. Zoe needed to pick a song to play and, since she didn’t know any of the songs in her song books, she needed to have a reason to pick one over another. Zoe figured that Neal Diamond was as close as she was going to get to a diamond tiara, so she went with that. But Forever in Blue Jeans just sort of appeared. It wasn’t until later that I thought about the words and how much they might add to the novel. 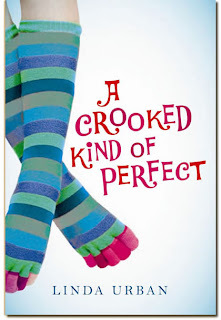 A Crooked Kind of Perfect is about a girl who dreams big—really big. What were your dreams at age eleven? Did you ever want to play the piano? I wanted to be like the heroine in whatever book I was reading at the time. It seemed to me that my favorite books were about girls who were unappreciated or underestimated but were eventually recognized for being the most beautiful or talented or magical or whatever. I did, at one time, think that playing the piano might be that thing for me, but I really was no musician. And besides, we had that organ. I think it is a great cover. Isn’t it amazing how a simple image gets at the heart of things? Who has been your biggest supporter during your writing journey? My editor, Jeannette Larson, has been wonderful. She puts up with lots of lunatic email. My two biggest supporters are my friends Myra Wolfe and Marla Frazee. Myra was my writing buddy through that book and every Friday she read whatever it was that I had written that week, and I did the same for her. That kept me writing. And Marla is just about the most inspirational person I know. I’ve been honored to watch her books in progress and have learned so much. And she laughs at my jokes. I am. The Cybils readers and judges are so well read and so up on current trends in children’s literature. Just to have those women spending time with my novel is an honor. Does award season (best-of season) make you nervous or excited as a writer? I guess all of that. Mostly, I’m trying to keep my head in my current writing. Still, my bookstore experience tells me that a couple of Best Of list mentions or a big award cam bet the difference between a book that has a significant shelf life and one that is slated for post-Christmas returns. Aw, thanks. I can’t really talk about my work in progress, to do so squeezes the juice right out of things. I am glad you’d like to see another book from me. Will a picture book do for now? I’ve got one called MOUSE WAS MAD coming out from Harcourt in Spring 2009-ish. When the story is working. Those hours spent “in the zone” are just plain magic. Is this something you’ve always wanted to do? Something you’ve always dreamed of and worked for? I loved writing when I was a kid, but I really didn’t think of it as a career possibility. My parents raised me to be more practical than that – and also, I never met an author. I kind of thought that all the books had already been written. I knew plumbers and hairdressers and policemen and secretaries. So while I had wild someday dreams of writing a novel like Jo March did, I also knew those dreams were as impossible as becoming a princess or a fairy or any other fantastical thing I read about. Have you heard from any fans—any readers—since the publication of A Crooked Kind of Perfect? It is so cool to get email from people who have read your book. Most of those notes have been from grown-ups: writers, teachers, librarians, booksellers. I love that. The kid letters are really great, though. I got one that said: You must be like so rich! Who are some of your favorite authors? What are some of your favorite books? There are books I can read over and over: Sarah, Plain and Tall; Granny Torelli Makes Soup; Maniac Magee; Missing May; Stuart’s Cape; Charlotte’s Web; Donuthead; Toys Go Out; Rules; Tale of Desperaux . . . you want more? Newish on my list: Elijah of Buxton by Christopher Paul Curtis, which totally knocked my socks off. The authors of those books are among my favorites. Dang! That doesn’t even include the picture books. I love Marla Frazee’s work as author and illustrator. I’m also a sucker for just about anything David Small puts a pen to, especially those books written by his wife Sarah Stewart. Other books I love: How to Make An Apple Pie and See the World, Miss Rumphius, Roxaboxen, Andrew Henry’s Meadow, Some of Each, Little Bear’s Little Boat, Owl Moon, Apples to Oregon, The Great Gracie Chase. I do, sometimes, read grown-up books, too. Especially those by Wendell Berry, Ann Tyler, Richard Russo, and poet Billy Collins. What were some of your favorites at Zoe’s age? I read Little Women at that age and wanted to be Jo. I had a serviceable bedroom at the time, but dragged a card table and a folding chair into the unfinished, uninsulated room above the garage, so that I could write in the cold, like Jo did in her attic. Also, I had a real connection to the Little House books and read them over and over from the time I was eight until, well, yesterday. Finally, and a bit off topic, If you had twenty-four hours, a time machine, and a limitless supply of money, what would you want to do? I’d probably spend twenty-three hours trying to figure out where to go, forty-five minutes mad at myself for waiting so long, and fifteen minutes in line to buy a snack. I saw this book at the library the other day and did not pick it up. I will the next time I visit! Enjoyed your interview. Thank you for sharing this great interview! I loved this book, and it's nice to hear the backstory. Reverend Blue Jeans! All right, I'm printing the interview so I'll remember to read it when the book comes in on hold at my library. Thanks for doing one with this author as I know the book's been a big hit. Happy Holidays! I want her to write a sequel!! !